The results reveal prominent writers’ and marketers’ secrets to success. Frequency matters, as does length—as long as you’re providing useful information and not just meeting a word count. What separates successful bloggers from those who flounder? 1. 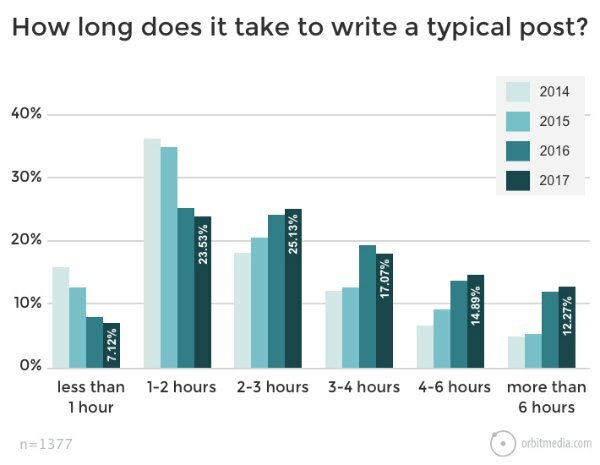 How long does it take to write a blog post? The average time spent composing a blog post in 2017 was three hours and 20 minutes. That’s up by four minutes from the previous year, but the trendline points to greater investments of time. Seventeen percent of bloggers say they spend three to four hours on a blog post. Fifteen percent of bloggers say they spend four to six hours on a blog post. Twelve percent of bloggers say they spend more than six hours on a blog post. Successful bloggers invest significant time in their trade. 2. 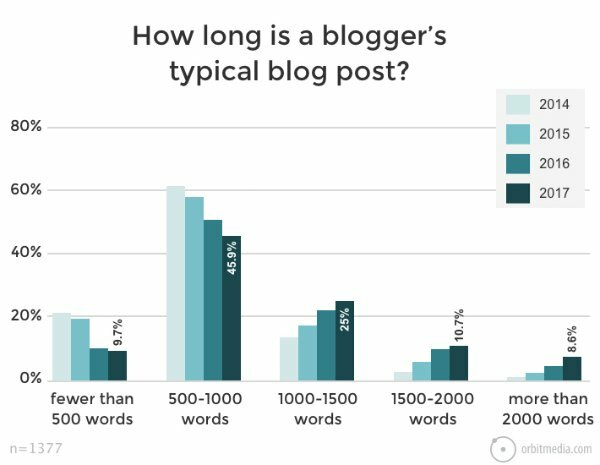 How long should a blog post be? The average post today is 1,142 words, but it’s clear that blog posts are getting longer. Orbit’s survey revealed that posts today are 41 percent longer than the typical 2014 post. 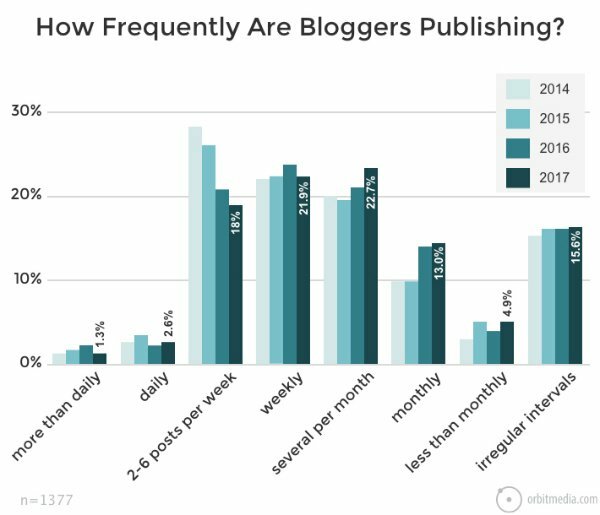 The number of bloggers writing shorter posts (from 500 to 1,000 words) is down, and the number of those writing posts with more than 1,000 words continues to rise. Does that mean every post should be longform? Not necessarily. Blog posts should be as long as is required to communicate an idea effectively. If you’re just filling a page with fluff to hit a word count, you’re wasting everyone’s time. However, if it takes 1,000 or more words to thoroughly examine a topic that is useful, educational and relevant to your target audience, then you’re on your way to successful blogging. It’s about quality, not word quantity. 3. How often should you publish posts? Three percent publish posts daily. Eighteen published two to six posts per week. Twenty-three percent publish several posts per month. Writing blogs is like exercise: You get better and stronger with frequent workouts. Writing blogs at a steady clip forces you to develop skills and improve your process. Writing more blogs means more chances of a post catching on and resonating. Writing blogs consistency shapes audience anticipation and expectations. Successful bloggers use multimedia. Using stunning images, graphics and video is essential. Text-only content just doesn’t cut it anymore. However, multimedia assets must be optimized and sized properly. If your files load slowly, or if they do anything to disturb user experience, then it’s all for naught. What the study did not mention is that updating older content can be tedious. To ease the process, try using the Search Console (by Google) and analytics to find your strongest material. The Search Console shows you how Google views and indexes your site. Look at crawl errors and content with backlinks to develop a short list of posts worth updating. With analytics, filter results by year and look for posts that are still pulling traffic. The real secret isn’t just polishing old content; it’s finding and updating posts that have stood the test of time.